The following is the Boxing Insider notebook for the week of June 7th to June 14th, covering the comings and goings in the sport of boxing that you might have missed. Undefeated heavyweight world champion Deontay “The Bronze Bomber” Wilder (36-0, 35 KOs) will defend his title in his home state when he battles two-time world title challenger Chris “The Nightmare” Arreola (36-4-1, 31 KOs) in the main event of Premier Boxing Champions (PBC) on FOX and FOX Deportes Saturday, July 16 from Legacy Arena at the BJCC in Birmingham, Alabama with televised coverage beginning at 8 p.m. ET/5 p.m. PT. Wilder returns to the ring after he was set to travel to Russia and defend his title against Alexander Povetkin on May 21 before the challenger failed a drug test that caused a cancellation of the fight. 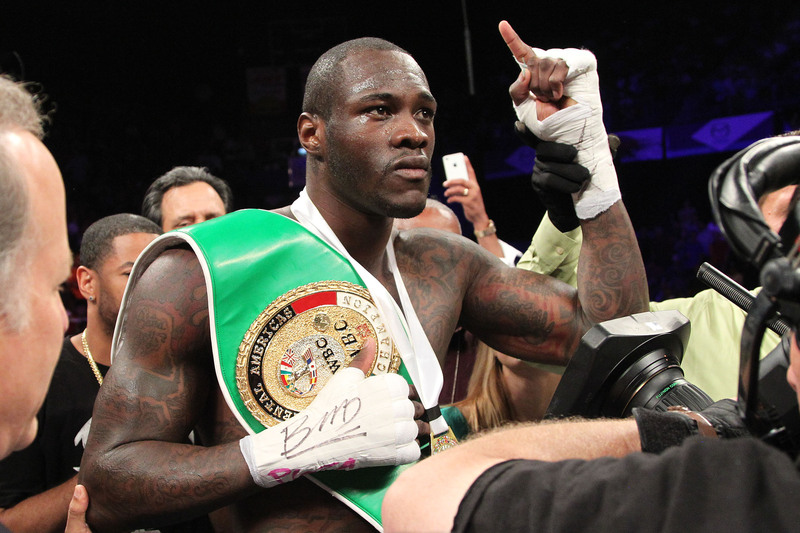 Now, Wilder will showcase his exceptional skills in primetime on network television as he takes on Arreola. It will be Wilder’s fourth defense and third in his home state of Alabama. “I’m always excited about coming home and being in front of my people where I’m the most comfortable,” said Wilder. “I’ve been traveling a lot, going over to Sheffield, England to train before I was supposed to fight Alexander Povetkin in Moscow. But because of his decision to use a banned substance, the fight didn’t happen. I’m disappointed about that, but it’s not going to stop me from being an active heavyweight world champion. It has also given me the opportunity to again defend my title before my hometown fans. It’s always good to come home. “We are extremely pleased that not only did the jury find that no contract ever existed between Canelo and All-Star Boxing, but issued a judgment against All-Star Boxing and ordered them to pay Golden Boy’s substantial legal fees. Over the last five-plus years, many questioned why we wouldn’t just settle the case before trial. The answer is simple: We would not be extorted. It was clear from the beginning that neither Canelo Alvarez nor Golden Boy Promotions had acted inappropriately in any way. We are grateful that the jury was able to see that. Current WBA Lightweight World Champion Anthony “Million Dollar” Crolla (31-4-3, 13 KOs) will face WBC Lightweight World Champion Jorge “El Niño de Oro” Linares (40-3, 27 KOs) in a huge unification blockbuster for the WBA, WBC and The Ring Magazine Lightweight World Championships at the Manchester Arena on September 24, 2016, live on Sky Sports. Crolla will make the second defence of his crown in his hometown fortress following his brilliant knockout victory over Venezuelan danger man Ismael Barroso in May, having ripped the title from Darleys Perez with another body shot knockout in November. “I’m having to pinch myself after everything that’s happened. I’m fighting the number one fighter in the division for the WBC, WBA and THE RING title; it doesn’t get any better than this. I’m very proud and privileged to be able to bring this fight to Manchester. “This is my first unification fight and a great personal challenge for me and my career,” said Linares. “Last year was an unbelievable year; I had the opportunity to fight in England against Kevin Mitchell in front of a crowd of passionate fight fans in one of the greatest fights of my career. This unification fight for the WBA, WBC and Ring Magazine Lightweight World Championships is another personal accomplishment for me and a great opportunity for me to fight in England once more, to be in front of a strong fight fan base. Super Featherweight Jason Sosa (18-1-4) is set to fight for the WBA Super Featherweight Title against Javier Fortuna (29-0-1) of the Dominican Republic on June 24th at the Capital Gym in Beijing China. He’ll be holding a public workout at Victory Boxing and Fitness at 600 Kresson Road in Cherry Hill, New Jersey on Wednesday, June 15th at 1:00 P.M. This event will be open to the public for photos and meet and greet. PBC star Erickson Lubin is set to make his primetime debut on NBC on June 18th. He offered the following quotes about himself in advance of his fight. Joseph Elegele (16-2 11 KOs) showed his strength and power Sunday night in the main event of Premier Boxing Champions: The Next Round on Bounce TV as he went toe-to-toe with Phil Lo Greco (27-3, 15 KOs) for 10 hard-fought rounds from The Lakeland Center in Lakeland, FL. Both combatants left it all in the ring, exchanging punches throughout the bout with close rounds that left the audience wanting more. Elegele of nearby Winter Haven, FL started the bout coming forward, slightly stunning Toronto’s Lo Greco with several flurries of punches that set the tone for a hard fought back and forth battle. The action picked up in round two as Lo Greco came in on the attack early in the round, pinning Elegele against the ropes and continuing to pepper him with punches to the body and the head. Despite being taken aback by the attack, Elegele came roaring back in the final seconds of round two and out of the corner to kick off round three. Lo Greco remained in the pocket, not afraid to continue to throw wide left hooks as the fighters traded punches back and forth. As the fight continued, Lo Greco backed Elegele up against the ropes, smothering him with punches despite Elegele’s four-inch height advantage. But round six was completely controlled by Elegele as he threw a combination of bruising punches that very well could have sent Lo Greco to the canvas. However Lo Greco remained in the pocket. In the 10th and final round, Lo Greco came out strong, outworking Elegele, but with less than 20 seconds to go in the bout, Elegele stunned Lo Greco with a barrage of punches up against the ropes. Judges scored the bout 97-95 and 96-94 twice, all for Elegele, the winner by unanimous decision. Part of the live telecast, former world title challenger Jayson “La Maravilla” Velez (23-2-1, 16 KOs) of Juncos, Puerto Rico will face Nicaraguan warrior and former WBC Silver Featherweight Champion Rene “Gemelo” Alvarado (23-7, 16 KOs) in a 10-round super featherweight Fight of the Year candidate. The exciting fight card will be in contention as one of the best events of the year as the night promises non-stop action from four top fighters willing to leave it all on the mat on July 15. Part of the non-televised undercard and streaming on RingTVLive.com, Cesar Diaz of Palmdale, Calif. will make his professional debut in a scheduled four-round super bantamweight fight. Undefeated prospect Rigoberto Hermosillo (5-0-1, 3 KOs) of Victorville, Calif. will participate in a six-round featherweight fight and Jhon Leon of Los Angeles will also make his professional debut in a four-round welterweight fight. All opponents will be announced shortly. A group of the best young boxers in the United States will head to Puerto Rico on Thursday to compete with some of the best amateur’s in the world. The competition will take place on June 17th and 18th. Dagoberto Medros will head down to Puerto Rico and train and stay at the Puerto Rican Olympic training Center. The team will be joined by coaches Willie Moses, Robinson Velez, Gabriel Flores, Edgar Gerena, Bernard Hackett Jr. & Dagaberto Mederos.